In an economic analysis this week the research firm said, the SACU and structural rigidities in the country’s expenditure profile will keep the fiscal deficit from narrowing more substantially. 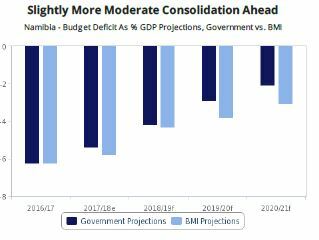 BMI forecast is that the fiscal deficit in Namibia will narrow to 4.3% of GDP in FY2018/19 and 3.8% in FY2019/20, down from an estimated 5.8% in FY2017/18. “Our mining team expects uranium production to increase by 50% in 20 19 as the Husab mine reaches full operational capacity. Moreover, the government committed to streamline Namibian Revenue Agency (NAMRA)’s operations by 2019, in its 2018/19 budget speech,” they added. BMI said the NAMRA, established in December 2017, is set to boost the country’s tax revenue collection capabilities enforcing better compliance and recovery of arrears. With a tax-to-GDP ratio averaging 23%, Namibia ranks among the top ten Sub-Saharan Africa countries based on tax collection efficiency, but still falls short of global average rate of 34%. “We believe that the new tax collection agency, along with a new system a more intuitive online tax registration and payments system to be rolled out in July 2018 will allow Namibia to increase tax revenues through improved tax collection,” BMI added.